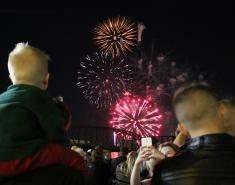 Rockets Over the Red Fireworks Festival will return with a bang to the downtown Shreveport-Bossier riverfront, from 4-7 p.m. on Saturday, Nov. 24. The fireworks show will begin at 6:45 p.m. The free, family-friendly festival will take place simultaneously at Louisiana Boardwalk Outlets, located at 540 Boardwalk Boulevard in Bossier City and Riverview Park, located at 601 Clyde Fant Parkway in Shreveport. Both festival locations will have free activities for children as they wait for the fireworks show. The first 500 kids to arrive at both locations will receive a free light-up necklace, the perfect touch for watching the fireworks after the sun goes down. Parents will be able to use their own cameras to take photos of their child with Santa for free at both locations. Children can also play in bounce houses for free provided by the Warrior Network at Louisiana Boardwalk Outlets and Riverview Park. The Warrior Network will also be selling hot chocolate, and they be accepting donations that support programs for Barksdale Air Force Base’s military community. 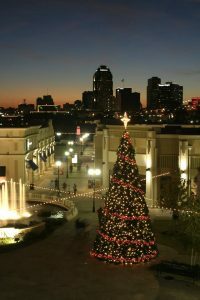 If you’re looking to get some holiday shopping done, head to Louisiana Boardwalk Outlets on the Bossier City side of the festival. The lifestyle center is bookend by Horseshoe Casino & Hotel and Margaritaville Resort Casino and features over 50 outlet stores and restaurants, an IMAX movie theater, plenty of free parking, and an awesome view of the Red River and the fireworks show. Louisiana Boardwalk Outlets welcomes lawn chairs and blankets for this event, but ice chests and coolers will not be permitted. Live entertainment at Louisiana Boardwalk Outlets will include Red River Pipes and Drums (4:05 p.m.), Westwood Elementary Junior Leadership Team (4:30 p.m. and 5:15 p.m.), Bossier Parish Talented Arts Program (4:45 p.m.), and the BPCC Music Jazz Band (5:40 p.m.). The entertainment stage at Louisiana Boardwalk Outlets will be located in the picnic area near Copeland’s Cheesecake Bistro. If you’re planning on shopping local this Small Business Saturday, Nov. 24, check out the East Bank Market in the newly renovated East Bank Plaza, located at 655 Barksdale Boulevard, just a few blocks away from Louisiana Boardwalk Outlets. The market will include over 45 local and regional vendors selling everything from hand-crafted tea and home decor to boutique clothing and beard care products. Be Bossier will be there, too, giving out free Bossier City swag! East Bank Plaza is located in the heart of the East Bank District, Bossier City’s newest entertainment district along the 400-1100 blocks of Barksdale Boulevard. Click here to RSVP to the official East Bank Shop Small Market Facebook event. Rockets Over the Red Fireworks Festival is presented by the Shreveport-Bossier Convention and Tourist Bureau, the City of Shreveport, the City of Bossier City, Louisiana Boardwalk Outlets and Pyromania Fireworks, LLC and is sponsored by KSLA, KRMD, Magic 102.9, Q97.3, KMJJ, and The Ticket Sports Radio. For more information about Rockets Over the Red Fireworks Festival, click here.